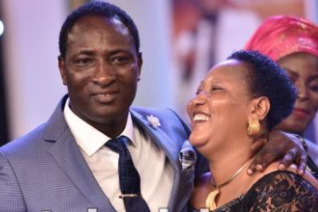 PRESIDENT and General Overseer, Christ Mercyland Deliverance Ministry, Prophet Jeremiah Fufeyin along with ace actor, Kanayo O. Kanayo and Chinwe Owoh celebrated Prophetess Anthonia Fufeyin birthday on Sunday in a grand style. Fufeyin who said that he wants the birthday in a low key shocked his congregation when he presented a cheque of N30million to his wife. The Prophet said that he owes his wife love, as she stood with him when he had nothing till now. Reading from Ephesians 5:25, Fufeyin said that husband should love their wives as Christ loved the Church, insisting that was why he has to celebrate his wife in a special way. Kanayo who anchored the brief birthday oration advice couples to live in love and harmony, supporting one another. He urged Nigerians to love one another and believe in the country, insisting the future is bright.